MAT is both a discovery and a creation. It is a fusion of art and science. It is the human science of the 21st century. Place and date of birth: 03/25/1943, at 11:20 in Aubert Hospital, Fez, Morocco. Places of residence: Tanger until April 1962, Rabat until December 1973, Paris until December 1975, Caracas until July 1984, Madrid until May 2009. Since then, she lives in Javea. Husbands: Haïm Benisty (April 1962-December 1973), Leopoldo Azancot Franco (July 1984-June 2007). Offspring: Gad Benisty (February, 13, 1963) and Daniel Benisty (November, 13, 1964). Intellectual property records, including books: See link. Preciada Azancot (*), creator in human sciences of MAT (the Metamodel of Analysis that Transforms), and in oil painting of the pictorial trend Transformational Expressionism, was born on 25 March 1943 in Fez where her parents were refugees from persecution by Nazis, Pétainistes and Franco supporters because her father Moisés H. Azancot was a Grand Master Mason (33rd degree of the Grand Lodge of France), and had written books and articles denouncing Nazi barbarism and was therefore wanted for execution by the Nazis and their allies. After the war, she lived in Casablanca until 1948 when her parents, both natives of Tangiers, took her to live there. She was brought up in the international Tangiers of the period until her marriage in 1962 when she moved to Rabat to live with her husband, a senior official in the Hashemite government. There she gave birth to two sons (Gad and Daniel) and graduated in Public Law with postgraduated studies in both international public law and political sciense from universities approved by Bordeaux at the same time as studying at the Academy of Fine Arts. In 1973, once divorced, she moved to Paris and worked as an organisation and methods engineer with the company SERETES (the consulting branch of SERETE, the most important engineering firm in France). 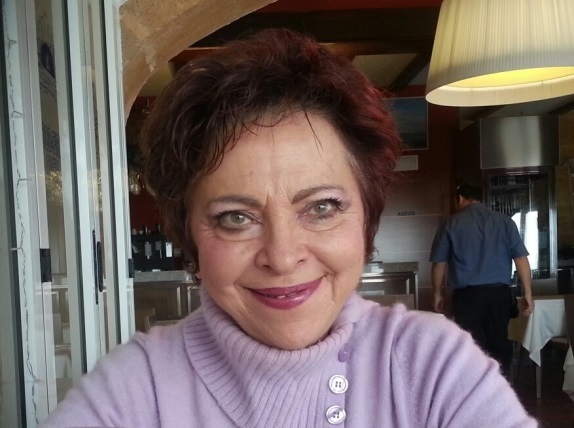 In 1976 she went to live in Caracas where she directed strategic change management processes at several Venezuelan banks at the same time as studying Transactional Analysis during five years, graduating as an Advanced Special Member of ALAT (Transactional Analysis Association of Latin America). In 1984 she met the man who would also become her husband, the novelist Leopoldo Azancot Franco and went to live with him in Madrid where she adopted Spanish nationality to honour her own Sephardic roots. She stayed there until 2008. Since then, attracted by the coast of Alicante which, with its landscape and multi-cultural character, reminded her of the international Tangiers of her childhood, she decided to install herself at a distance of five metres away from the waves, in order to close one life cycle and open another. Between 1980 and 1982, she discovered and developed MAT and after experimenting it on more than 50,000 cases and verifying the accuracy of its laws and aptness of its propositions and results she started to write it down and register it as intellectual property in her more than twenty books published to date as well as in her numerous courses created to train Masters in MAT, coaches, Instructors, Teachers, Analysts and Academics in the MAT School of Leaders of the Socratic Tradition founded in 1987 and in which she continues to train her students to become integral leaders of their own lives and MAT professionals. Club Meteoro, which she also founded, takes care of training children aged 7 to 11 to become experts in authentic emotions so that they can become happy small leaders and friends-partners of their parents who study in parallel, alongside them, what their children’s special and personal talent and vocation is in order to encourage what is best in them. In 2003 she founded the consulting company MAT21 (now, MAT-Cachet) of which she is president. Also noteworthy is the research she conducted at the Hospital de la Princesa in Madrid using MAT in relation to detecting standards of emotional behaviour that favour certain high risk diseases such as heart disease, cancer, lung disease, neuropathies and nutritional disorders. These results were presented in May 2010 at a solemn event sponsored by the Pfizer laboratories and presented by the Dean of the Faculty of Medicine and President of the Illustrious College of Physicians of Zaragoza to more than 180 doctors who considered these results to be a new paradigm in the sciences of health. MAT (the Metamodel of Analysis that Transforms), is the discovery of the emotional and sensory engineering of the human being’s seven-dimensional personality structure – and not four-dimensional as believed since the time of the Ancient Greeks – and is known as being the first precise science (universal, objective, transferable and measurable) of the functioning of the human being in all his facets, personality typologies, creations and ways of being. As a writer, Preciada Azancot has written more than twenty books and published 18 related to this science. Since 1986 Preciada Azancot has also developed another facet of her personality as a plastic artist (painter) holding several individual exhibitions in prestigious art galleries of Madrid, Barcelona and museums and foundations such as the Fine Arts Museum of Santander and Caja Madrid foundation in Barcelona or Isaac el Cec House in Gerona. Preciada is the creator of a new plastic trend, Transformational Expressionism and is particularly known for her portraits of major composers. At present, her whole family (a brother, her two sons and five grandchildren) all live in Paris where she spends long periods each year. (*) Translated into English from the Wikipedia page in Spanish.